An object called GRB 150101B, first detected as a gamma-ray burst by NASA's Fermi Gamma-ray Space Telescope in January 2015, may indicate a merger of two neutron stars. 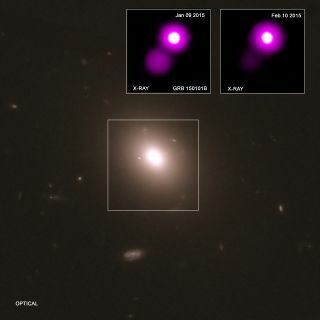 This image shows data from NASA’s Chandra X-ray Observatory (purple in the inset boxes) in context with an optical image of GRB 150101B from the Hubble Space Telescope. Last October, an international team of researchers made an astonishing announcement: They had detected both light and gravitational waves generated by the crash of two neutron stars, an event dubbed GW170817 (because it had been observed on Aug. 17, 2017). GW170817 was the first documented neutron-star merger. But it now appears to have some company. In January 2015, NASA's Fermi Gamma-ray Space Telescope detected a powerful burst of high-energy gamma rays in a galaxy 1.7 billion light-years from Earth. Shortly thereafter, a number of other instruments observed this source, known as GRB 150101B. ("GRB" is short for "gamma-ray burst.") Among those follow-up scopes were NASA's Hubble Space Telescope, the Chandra X-ray Observatory and Neil Gehrels Swift Observatory, as well as the Discovery Channel Telescope at Lowell Observatory in Flagstaff, Arizona. The combined observations revealed key similarities between GW170817 and GRB 150101B. For example, both events produced unusually short-lived and faint gamma-ray bursts, bright-blue visible light that lasted for several days and more protracted X-ray emissions, study team members said. And both sources reside in elliptical galaxies with stars that are a few billion years old, with no obvious star-forming regions. "We have a case of cosmic lookalikes," study co-author Geoffrey Ryan, of the University of Maryland at College Park (UCMP), said in a statement. "They look the same, act the same and come from similar neighborhoods, so the simplest explanation is that they are from the same family of objects." And going from one detected object to two is a big deal, said study lead author Eleonora Troja, of NASA’s Goddard Space Flight Center in Greenbelt, Maryland, and UCMP. "Our discovery tells us that events like GW170817 and GRB 150101B could represent a whole new class of erupting objects that turn on and off in X-rays and might actually be relatively common," Troja said in the same statement. Without gravitational-wave measurements, researchers cannot say for sure how massive the two GRB 150101B objects were. So, it's possible that the merger involved a neutron star and a black hole, study team members said. "We need more cases like GW170817 that combine gravitational wave and electromagnetic data to find an example between a neutron star and black hole. Such a detection would be the first of its kind," co-author Hendrik Van Eerten, of the University of Bath in the United Kingdom, said in the same statement. "Our results are encouraging for finding more mergers and making such a detection." The new study was published online today (Oct. 16) in the journal Nature Communications. You can read a preprint of it for free at arXiv.org.